ESA, France - April 6, 2017 - A Soyuz rocket operated by Arianespace from Europe's spaceport in Kourou will boost ESA's upcoming exoplanet satellite into space. Cheops will share the ride into space with another payload, with the two separating in turn into their own orbits soon after ascent. Arianespace has confirmed it will provide the launch services, with the contract to be signed by ESA in the coming weeks. While the exact launch date remains to be confirmed, Cheops is expected to be ready by the end of 2018 for shipping to Kourou, with all testing completed. A Soyuz rocket operated by Arianespace from Europe's spaceport in Kourou will boost ESA's upcoming exoplanet satellite, CHEOPS, into space. A Soyuz rocket operated by Arianespace from Europe’s spaceport in Kourou will boost ESA’s upcoming exoplanet satellite into space. Cheops will share the ride into space with another payload, with the two separating in turn into their own orbits soon after ascent. Arianespace has confirmed it will provide the launch services, with the contract to be signed by ESA in the coming weeks. While the exact launch date remains to be confirmed, Cheops is expected to be ready by the end of 2018 for shipping to Kourou, with all testing completed. Cheops will be launched on a Soyuz from Europe’s Spaceport in Kourou, French Guiana. 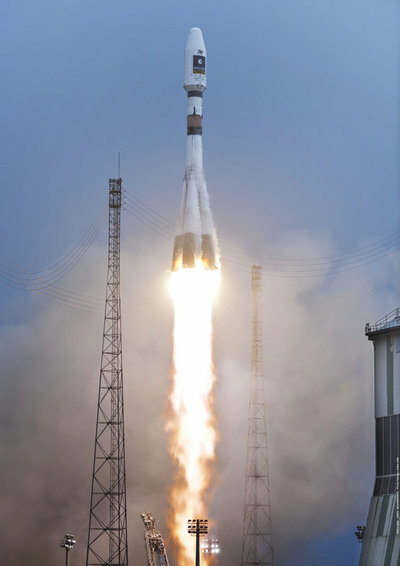 The image shows the first Soyuz launch from Kourou, in 2011. 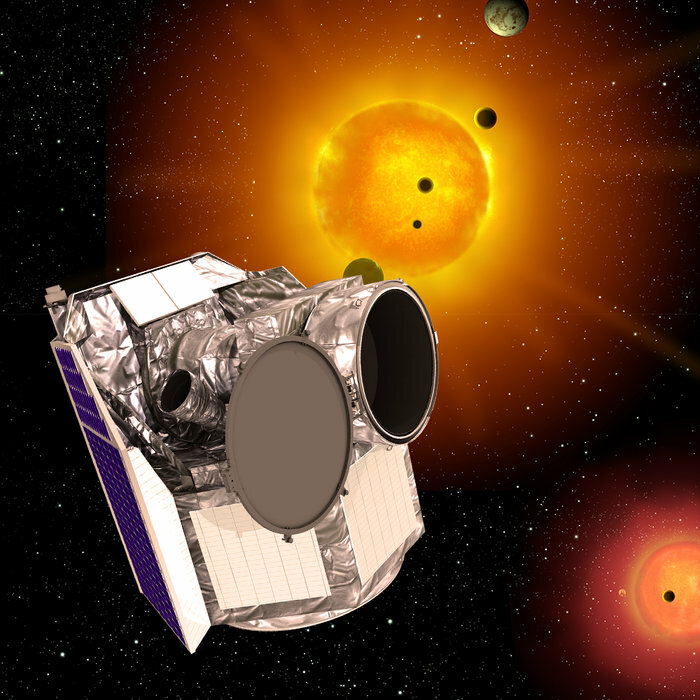 Once in space, Cheops – the CHaracterising ExOPlanet Satellite – will target nearby, bright stars already known to have orbiting planets. Through high-precision monitoring of a star’s brightness, scientists will examine the transit of a planet as it passes briefly across the star’s face. This allows the radius of the planet to be accurately measured. For those planets of known mass, the density will be revealed, providing an indication of the structure. These key features will help us to understand the formation of planets in the Earth-to-Neptune mass range. The mission will also contribute to ideas about how planets change orbits during their formation and evolution. Cheops will also identify targets for habitability studies using future ground- and space-based telescopes, including the international James Webb Space Telescope being launched next year. A planet, whose orbit is aligned in such a way that it crosses the disc of its parent star as seen from Earth, causes the star to appear less bright while the planet is transiting the disc. 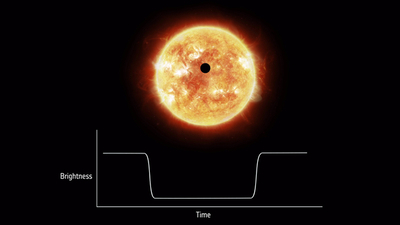 By detecting these periodic decreases of brightness over time, it is possible to detect the presence of the planet orbiting the star. Cheops will operate in a 700 km altitude orbit around Earth angled about 98º to the equator. As it circles the globe from pole to pole, the satellite will ride the terminator between day and night such that it will always be directly above sunrise or sunset. This orbit offers stable temperatures and a constant solar illumination, keeping the solar array in sunlight while minimising the effects of stray light leaking into the telescope. Cheops is an ESA mission in partnership with Switzerland and with important contributions from 10 other member states. Artist’s impression of ESA’s Cheops astronomy satellite. Cheops is a small space telescope dedicated to observing nearby stars that are already known to have planets. Through very precise measurements of the slight dimming of the stars as the planets pass in front of them, astronomers will be able to determine the sizes of the planets and learn more about how planetary systems form. The satellite is being built as a collaboration between ESA and a consortium of European countries led by Switzerland. Editor-in-Chief of ASTROMAN magazine: Roman Wojtala, Ph.D.
Premier Mateusz Morawiecki pogratulował laureatom konkursu "Teaming for Excellence"
Copyright ASTROMAN © 1995-2019. Wszelkie prawa zastrzeżone. Projekt i wykonanie: TAU CETI.